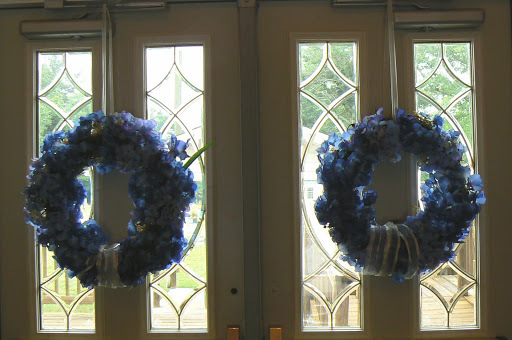 Decorating the church on Friday: Hydrangea wreaths on the front doors. 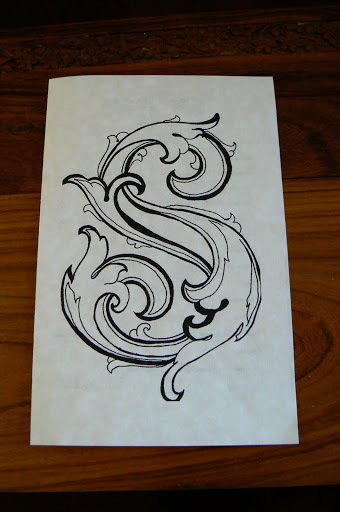 The program fronts on cream parchment, designed by Greta. Greta repurposed an old book into her guest book. 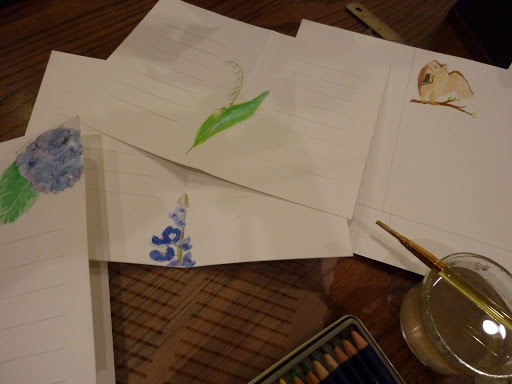 She sewed new pages into the old cover and then she painted tiny watercolor paintings in each corner. 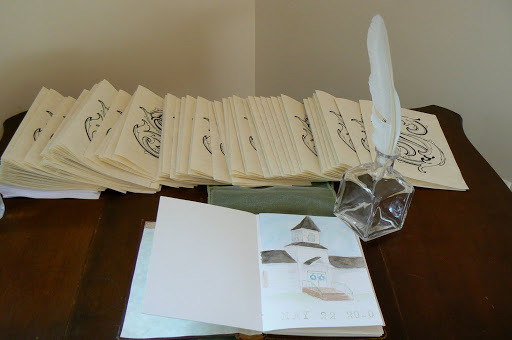 The guestbook table, with programs, guestbook, and ink well with feather pen in place. 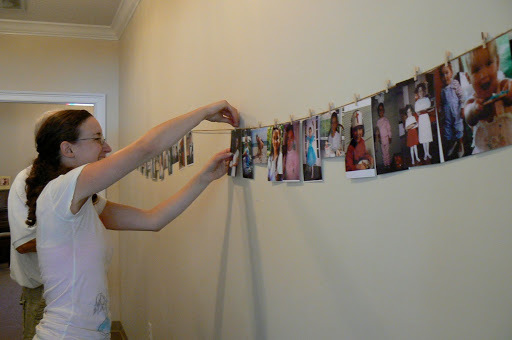 A photo walk down memory lane, strung on twine. Props for the photo booth. 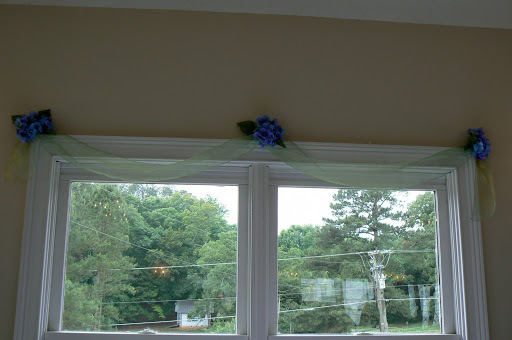 Sheer green fabric swagged across the windows with little hydrangea nosegays at each corner. We decorated 11 windows. I bought two dozen chair sashes to use as wide ribbon. We used it everywhere. 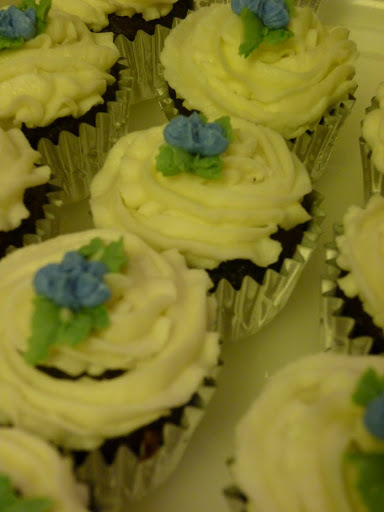 A floral detail on the food table. This is another way we used a chair sash. 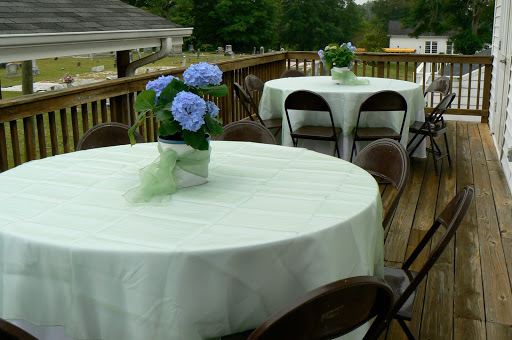 Round tables on the deck with floor length white cloths topped with shorter sheer green toppers. Potted hydrangeas in the center wrapped in white paper and tied with more of the wide green chair sashes. In the distant background you can see the windows of our original reception location: the historic schoolhouse that turned out to have extensive termite damage. 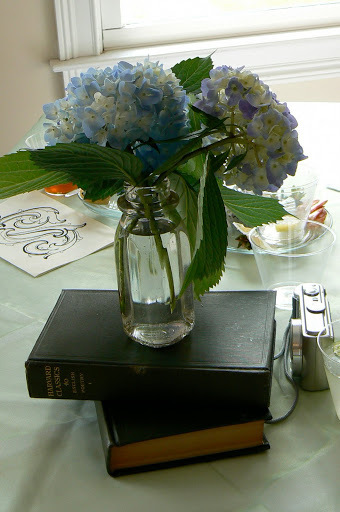 The indoor tables had centerpieces of stacked books and a vase of hydrangeas. 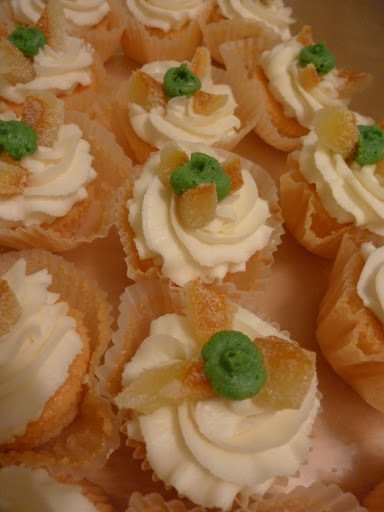 They also had the same floor length white tablecloths and sheer green toppers. Greta chose hydrangeas as her wedding flower long before she was even engaged. She loves the shades of purplish-blues the flowers have when they are grown in acid soil. 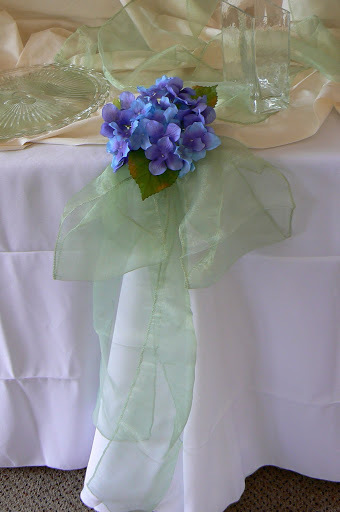 Later, she chose green for the bridesmaid’s dresses to set off the blue flowers. 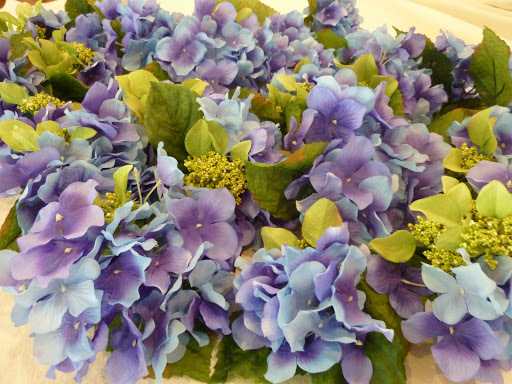 Early in the wedding planning process we ordered many bundles of cut hydrangeas from a florist. Hydrangeas don’t need much done to them, so we ordered just the cut flowers, not arranged flowers. On Saturday, a week before the wedding, the florist canceled our hydrangea order. She said they aren’t available. We immediately started hunting for another source: two more florists couldn’t get them, but eventually we found a florist who agreed to order some for us. They would arrive on Thursday. We also hunted up nursery shrubs in bloom just in case the new florist bombed out too. We saw several potted plants at three different nurseries that were possibilities. All we really needed was 12 stems: 3 stems for each bridesmaid to carry. All the other flowers we could fake with assorted white flowers and silk hydrangeas where it wouldn’t be noticed. We sent out Facebook messages to our friends asking if anyone had hydrangeas in bloom in their yard. Answers poured in: many dozens of hydrangea buds all over town, but no flowers in bloom. The winter had been too cold, and the hydrangeas are late in blooming this year. On Thursday morning we talked to the florist and her hydrangeas had not come in as expected. Her supplier gave no explanation. There just were none. None. No blue; no white. Off to the garden center we ran. We bought two huge pots in full bloom, but the rain on Wednesday had muddied some of the blooms. 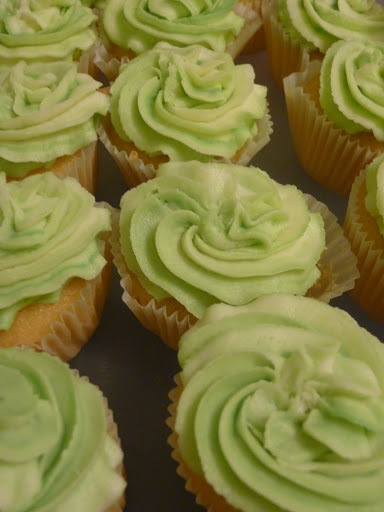 We thought we could gently rinse them off and, once dry, they would look clean. And then friends started calling. 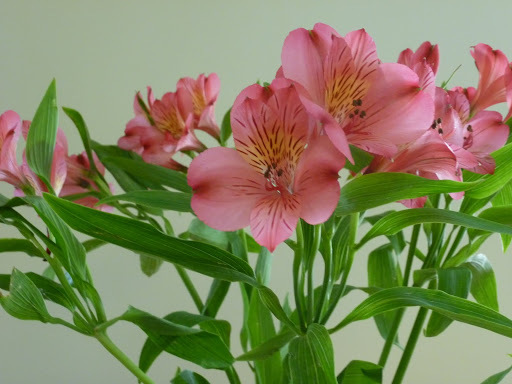 “I have two flowers in bloom this morning. You may have them.” “I have three blooms.” “I have two.” On it went. 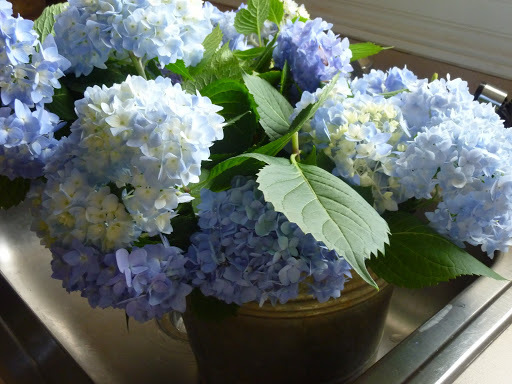 They cut them and brought them to our house and our front porch became a bower of hydrangeas in buckets. It rained again so we kept both the pots and the buckets protected. We ended up with many more than 12 blossoms. We have enough for each girl to carry three, and extras to make corsages and boutonnieres and centerpieces and table decorations. 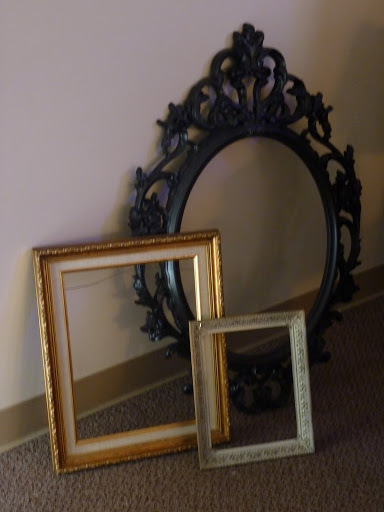 Yesterday I got a jump start on decorations for the wedding reception. These little nosegays were fun and quick to put together: two for each window, with sheer, light green bunting swagged between. A beautiful Mother’s Day bouquet from David. Today I took a break from wedding preps and went garage saling with Heather. 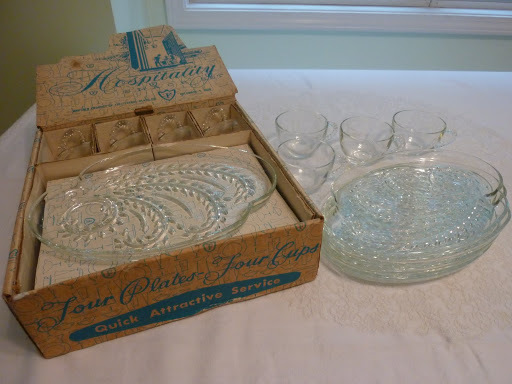 I was so excited to find two full boxes (eight settings) of these “Homestead” glass dessert sets! I got both boxes for $10. Sadly, one box was totally trashed, so I tossed it. Previously, I had collected 12 other sets, so that brings my total up to 20. 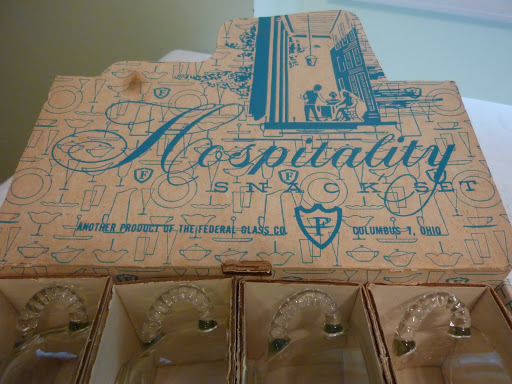 They were made by Federal Glass Co of Ohio. There is no zip code, so that means they were manufactured before 1963. I’m guessing they are from the 1950’s. 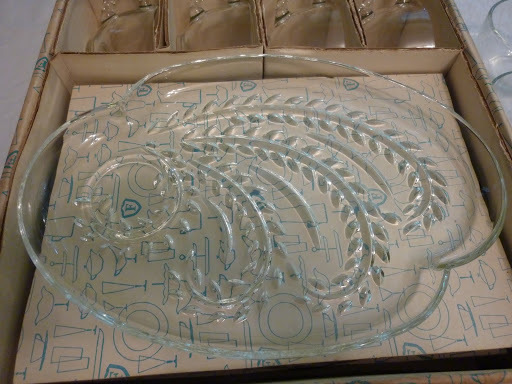 My mom and grandma both had this same pattern. I remember Mom using them once or twice when I was very young. My favorite way to use them is for lunch, serving a fruit salad or chicken salad in the punch cup. Today we don’t usually serve punch in such tiny cups.